Mature Canary Island Date Palms are rarely found in nurseries. These unique specimens are collected from existing landscapes throughout the warmer regions of the United States. Because they are collected palms, obtaining exactly matching Canaries is not a realistic goal. We can come fairly close but for applications where an exact match is a necessity, you may want to consider changing to another Palm in our nursery so it can be matched far more closely. The Canary Island Date Palm is one of the most majestic of all palm trees. This sub-tropical palm tree has been grown for exotic landscape for over 200 years. The Canary Island Date Palm is also known as the "Pineapple Palm" because of the unique pineapple shape it forms after it is trimmed. 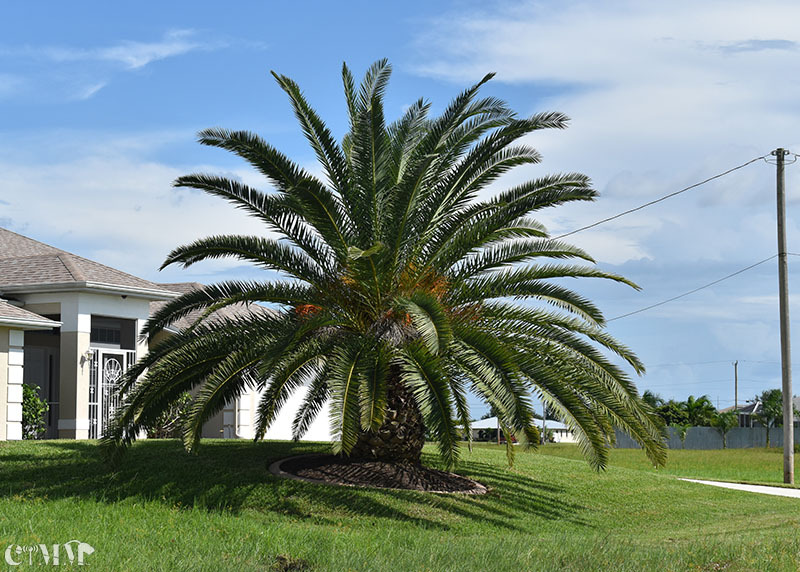 This large, stately palm often reaches a size too massive for most residential landscapes but, fortunately, it is very slow-growing and will take a considerable amount of time to reach its 50 to 60-foot-height. Canary Island Date Palm is most impressive with its single, upright, thick trunk topped with a crown of 8 to 15-foot-long, stiff leaves with extremely sharp spines at their bases. The stalks of inconspicuous flowers are replaced with clusters of one-inch-diameter, orange-yellow, date-like, ornamental fruits which ripen in early summer. Canary Island Date Palm should be grown in full sun on fertile, moist soil for best growth but is tolerant of any well-drained soil. It can be planted on the inland side of coastal condominiums and large homes due to moderately high salt-tolerance. It does well as a street or avenue tree, even in confined soil spaces. Canary Island Date Palm will require pruning to remove old fronds. Older leaves frequently become yellow from magnesium or potassium-deficiency. Preventive applications of appropriate fertilizer helps avoid this.